Comment: There is some over spray from a paint job on the vinyl soffit. The vinyl soffit on the peek of the garage side of the house, above the vent has noticeable paint spray. Looking to have about 8 feet down on each side of the peek removed and replaced with matching color soffit. Possibly replacing the soffit on the entire eve if necessary. Vinyl soffit, cream in color. Comment: A lawn mower threw a rock against the siding and tore a hole about 3" in diameter. I have it covered now with clear tape. Also the siding has faded as the house is 12 yrs old. Comment: I just saw a 2 or 3 inch diameter hole this morning. Probably 8 or 9 ft from the ground I would like to have this repaired as soon as possible. Jefferson Siding Contractors are rated 4.68 out of 5 based on 305 reviews of 18 pros. 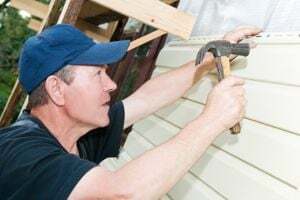 Not Looking for Siding Contractors in Jefferson, GA?